This Super Healthy Enzyme Drink is very effective. Basically you can use any kind of fruit. You need equal amounts of fruit and white sugar. The fruit is washed and carefully dried, not even one drop of water should remain. We use white sugar because it must be absolutely sterile and germ-free not to go moldy. That is why brown sugar is not recommended. 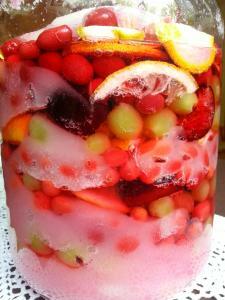 In a container made from pottery, glass or stainless steel you put layers of fruit and sugar. This has an osmotic effect on the fruit which starts to release the juice. In time the microbes and yeasts in the fruit turn the sugar into something very healthy. In Asia they even treat cancer patients with these kind of enzyme drinks. You can sprinkle some sugar on the bottom of the container, but the most important to remember is to use sugar as the last layer to avoid mold. Here I used cornelian cherries. After 14 days I poured off the liquid into a glass bottle. The fruit still can be used to make jam. The cherry seeds are easily removed. 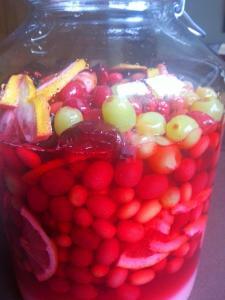 It will not taste as delicious as made with fresh fruit but it is very healthy because of the fermentation. I think I will make instead little cornelian cherry candy globes. Now you must be patient. The longer the bottles sit quietly without moving much, the healthier becomes the enzyme drink. The best is to wait 3 month. 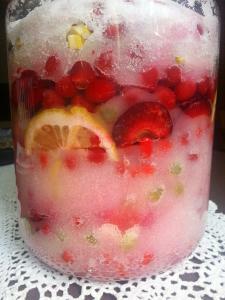 During this time the sugar ferments and produces more than 200 Enzymes. IMPORTANT: During the first few days airtight bottles should be opened very briefly, later maybe once-a-week. The fermentation produces gases which have to be let out. It is important to open the bottles only for a very short moment and close them right away. This way you avoid molds to start growing. If you don't have cornelian cherries you can use for example organic lemons, grapefruit, pineapples or other combinations. Cut it in cubes or slices but please, do not take off the peel unless there is no organic fruit available! In that case it would be better to peel it. It will also work but with the peel it is of course healthier! They recommend to drink daily 30ml or about 1 oz of enzyme drink! This is a great way to preserve your fruit, especially when you don't have much time available. It is very simple. I poured off the liquid already after 14 days. But I could have left those cornelian cherries for many months in that container. Just a few days ago some of us girls went cornelian cherry hunting. It is August and we found them. 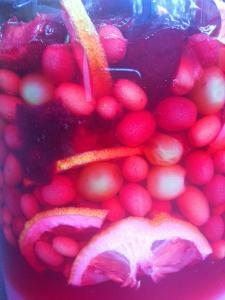 They were not yet fully ripe, but as I learned this makes a very healthy fruit enzyme drink. Here you see it after a few hours. Can you see what else I put into the glass? Yes, lemon, green grapes and a few plums. I wonder how that tastes. Please, try it yourself. Enzymes are very vital to sustain life.